Kefir vs. Yogurt: Which Is Better & Healthier? Home » Food and Nutrition » Kefir vs. Yogurt: Which One Is Better? If yogurt is on your weekly shopping list, you might have noticed a product called kefir located on the shelf closeby. I started noticing it more prominently in my grocery store a few weeks ago, and decided to look into it further. Kefir, much like yogurt, is a healthful dairy product made from cultured milk. They are both good sources of protein and high in calcium, potassium and B-vitamins, while each offers a unique blend of beneficial gut bacteria. But is one healthier or better than the other? It’s hard to say. I don’t think it’s as much about yogurt versus kefir as it is about using both of them to optimize health. The main differences between kefir and yogurt are the types and amounts of bacteria found within. Kefir offers a much more diverse array of cultures compared to yogurt, and they offer different benefits. Whereas the bacterial cultures found in yogurt are relatively small and “transient,” kefir can have two to three times the amount of cultures, while milk kefir can have up to 20 different types of probiotics. Comparatively, yogurts only really offer a handful of probiotics. *Based on 100 gm serving sizeOne major difference between yogurt and kefir (which has nothing to do with nutrition) is consistency. Whereas yogurt is thick and consumed with a spoon, most kefir is sold as “milk kefir,” and it is a runny liquid. It can be purchased as cheese or other more solid forms, but the most convenient and common form is a runny, milky liquid that is best consumed as a drink, in a smoothie, or poured over cereal. In many instances, it can be subsisted for yogurt in recipes where consistency is not a major issue. So if you want to try something new, milk kefir could be worth a shot! Plain yogurt has a thick consistency that varies based on the way it’s made; Greek yogurt, for example, is rather thick whereas less-processed yogurt is thinner and runny. This is accomplished by draining the whey protein. The more whey that’s drained, the thicker it is. For the most part, the flavor of yogurt is rather consistent, with slight variations. But typically plain yogurt is slightly sour—something that can be altered with the addition of natural flavors like honey, nuts, and berries. Kefir, in my opinion, is sourer than yogurt. It might be unpalatable to those who really don’t like sour tastes—but there is also an element of creaminess to it. However, I’d advise against taking a big sip if you’ve never had it before; the flavor can be rather surprising and you might relate it to spoiled milk. But much like yogurt, you can improve the flavor of kefir by adding some of the same items you’d use for yogurt. Kefir milk is naturally a little fizzy or bubbly, but there are some manufacturers who produce “flat” options without the bubbles. Both yogurt and kefir can be very healthy, but those benefits can quickly be erased depending on the kind you select; therefore, reading nutrition labels is of the utmost importance. Added sugars can take a healthy food and make it rather dangerous—and even combat the probiotic benefits of kefir and yogurt. Because plain yogurt and milk kefir can be unpalatable, manufacturers will add flavors like strawberry, blueberry, vanilla, and others to improve the flavor. Doing so, however, adds plenty of sugar. Added sugars, when consumed in high doses, can lead to weight gain, insulin resistance, type 2 diabetes, obesity, and a number of other related health problems. Additionally, new research is indicating that a diet high in sugar and processed food (which is what yogurt/kefir with added sugar is) can have negative effects on gut bacteria, which counters the benefits offered by probiotics. Now we can argue all day about whether or not the nutritional benefits outweigh the harms when it comes to consuming added sugars in kefir and yogurt, but in my opinion, you should avoid them. Do the best for your body by adding your own natural flavors; that way you get no added sugars, increase the fiber, and have total control over what you’re putting into your body. A healthier, more diverse population of gut bacteria can make a real difference in your overall health. In fact, the number of bacteria in your body outnumbers your cells by a scale of 10:1. This is becoming increasingly clear as more work is completed to highlight its benefits, and it’s possible there is plenty more benefits that are yet to be discovered. In your gut alone, there are at least 400 species that populate the space (ideally). This is altered based on your diet and how many cycles of antibiotics you’ve done in your life—but by consuming yogurt and kefir packed full of probiotics and yeast, you can repopulate and diversify these helpful organisms. Yogurt and kefir are both valuable, and as I said earlier, they are complimentary to one another. They perform different services, both of which are important to bacterial cultivation and stimulating a positive environment for gut bacteria. The probiotics in yogurt are largely transient, which means they pass through the gut, help keep your digestive tract clean, and provide a food source for the bacteria that currently resides inside you. 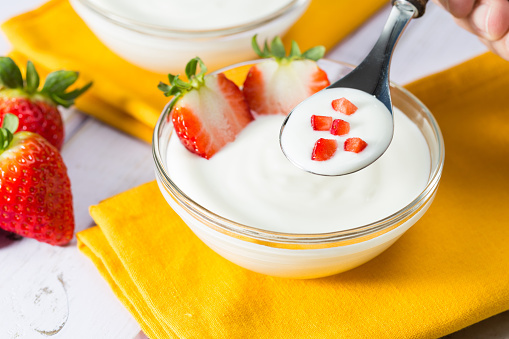 Various styles of yogurt have different probiotic cultures, and your typical plain, thick yogurt features Bifidobacterium lactis, Lactobacillus acidophilus, delbrueckii subsp bulgaricus, and streptococcus thermophilus. Because Greek Yogurt is processed even further to the point where virtually all the whey is removed, it only contains Lactobacillus bulgaricus and streptococcus thermophilus.Bacterial profiles are measured in yogurt products, kefir products, and probiotic supplements by the amount of probiotic organisms per serving and the diversity of those units. When it comes to the make-up of your gut bacteria, more is better. Kefir offers much more probiotic value than yogurt; however, yogurt is important in feeding these organisms so they can adequately perform their job. 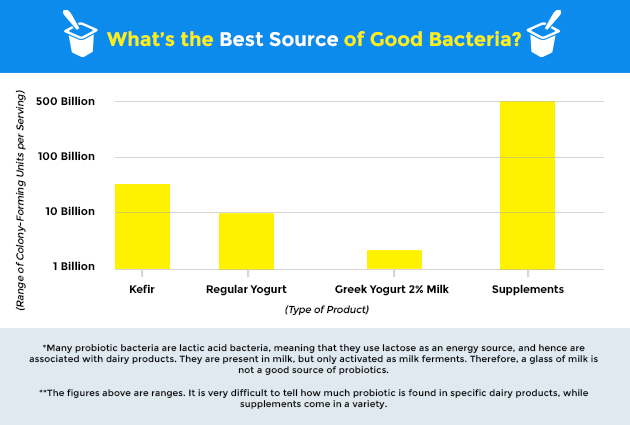 The fact is that when it comes to the diversity and sheer volume of bacteria, kefir blows yogurt away. Aside from containing far more bacteria and yeast than yogurt—one cup of kefir has about two or three times the amount of probiotic cultures as yogurt and up to 40 times the number of probiotic organisms (brand dependent)—kefir also reacts with your body in a different way. Where the roughly one billion probiotic organisms per serving of yogurt work to feed and clean your gut bacteria and intestinal tract, the up to 40 billion in a cup of kefir actually work to repopulate and colonize your microbial population. Therefore, it works better to increase the number and diversity of the population living inside you. Because of these two separate functions, yogurt and kefir are best used together. Yogurt can be consumed as little as one to two times per week, whereas kefir is best taken once per day—either in the morning with your first meal or before you go to bed. Repopulating your gut bacteria at these moments can help aid digestion throughout the day. Because yogurt probiotics largely act as a food and custodial source, it can be consumed less frequently.Of course the brand of yogurt or kefir, how it’s been processed, as well as other factors will create some variance in the amount of probiotic strains; it’s recommended you read the labels of all the products you buy. Clemente, J.C., et al., “The Impact of the Gut Microbiota on Human Health: An Integrative View,” Cell 2012; 148(6): 1258-1270. Smith, P.A., “Can the Bacteria in Your Gut Explain Your Mood?” The New York Times web site, June 23, 2015; http://www.nytimes.com/2015/06/28/magazine/can-the-bacteria-in-your-gut-explain-your-mood.html. Chen, H., et al., “Microbiological study of lactic acid bacteria in kefir grains by culture-dependent and culture-independent methods,” Food Microbiology 2008; 25(3): 492-501. Beck, L., “What’s the difference between yogurt and kefir?” The Globe and Mail web site, January 28, 2013; http://www.theglobeandmail.com/life/health-and-fitness/ask-a-health-expert/whats-the-difference-between-yogurt-and-kefir/article7904569/.